The Bills have re-signed K Dan Carpenter after a record-setting season in 2013. The Bills have re-signed K Dan Carpenter. In accordance with team policy, terms of the deal were not disclosed. 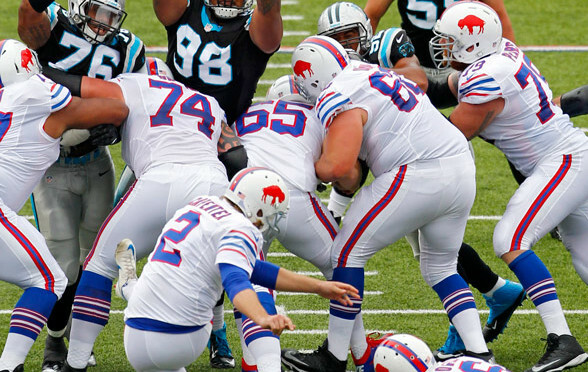 Carpenter matched a Bills record for field goals made in a season with 33 in 2013 and established a personal best 131 points - third most by a Bill in a season. He converted 33-of-36 field goal attempts and each of his 32 extra point tries to rank sixth in the AFC with 131 points on the year. The 6-2, 228-pound Montana product joined the Bills as a free agent on September 3, 2013. He spent his first five years in the NFL with Miami after signing with the Dolphins as an undrafted free agent in 2008. Carpenter has converted 160-of-191 field goals (83.8-percent) in his career, along with 186-of-187 point after tries for 666 points in 92 games played. His 160 field goals made since 2008 are fourth-most among NFL kickers.